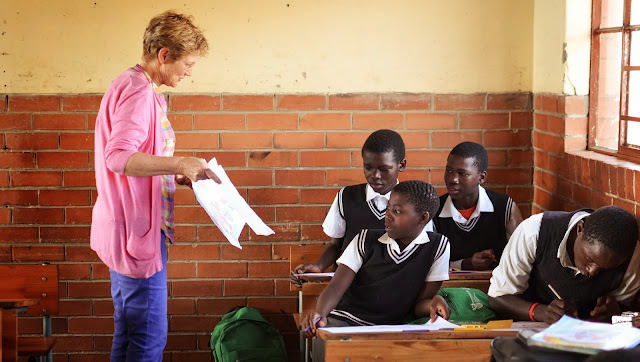 I've taught in a whole bunch of classrooms, both here and in England, but this rural school in South Africa was, no surprise, by far the barest. No ceiling, rafters showing, concrete floor, no lighting, blackboard with chalk writing on it (though no actual chalk to be seen, not left carelessly lying around the way whiteboard markers are here - clearly too precious). No shelves of books, no posters, no apparent resources other than the teacher. Which wouldn't be so terribly bad, if the teacher was a good one - but that's sadly in doubt. This was the school with the horrible fat woman who whipped a dozen or so kids just for saying hello to us. They were the ones we'd met the day before at the bush camp, where ranger Zama was helping them identify spoor, teaching them about the wildlife that they rarely see. It's a great programme, introducing them to conservation and hopefully engendering an interest in and feeling for, amongst other creatures, the rhino. But the school teacher who was accompanying them was asleep in another room for most of the time we were there (in the middle of the day) and when he did emerge was of no use anyway. I thought he was a resentful parent rope-in; I was shocked to learn he was their teacher. The children were all very neat and clean, though their uniforms had seen better days; as had many of the shoes lined up along the veranda outside, with their trodden-down backs and holes. They were shy of us, understandably, a dozen or so white people suddenly arriving from another world with books and balls and pens, and getting them to respond was hard. Of course it didn't help that their first language is Zulu and all I could say was Yebo, which means Hello, yes, ok, thanks... Versatile, like kia ora. 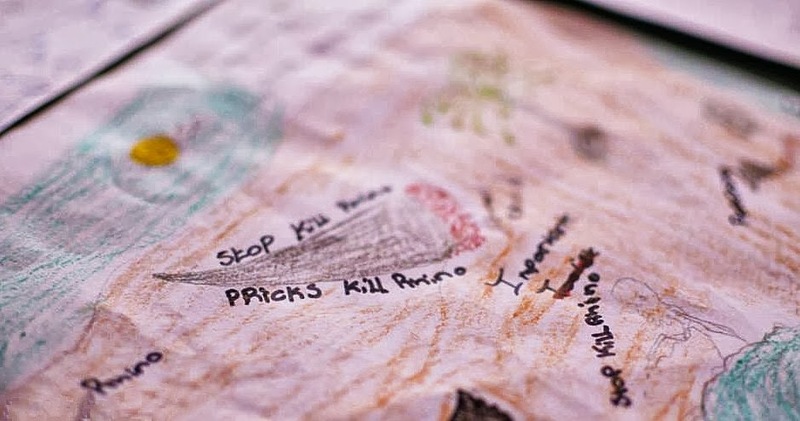 We wanted to encourage them to colour in their rhino pictures with imagination and flair, and to write heartfelt anti-poaching slogans. At least one of them got the idea. These photos by Chloe Boshoff.